Thanks to our flagship Farmers Market and West 3rd Street Melting Pot Food Tour, over the past 3+ years, we've had the privilege of making friends and building relationships with so many lovely people in mid-city LA who give special meaning to “City of Angels”. With great joy, I recently chatted one-on-one with West 3rd Street’s First Lady, the Joan of Joan’s on Third. I loved getting to know her better, on everyone’s behalf for the "Merchants We Love" series! Since 1995, Joan’s incredibly delicious cafe, catering, and marketplace have fed thousands of our tour guests, locals, tourists, and A-list celebrities like Anne Hathaway, Vera Wang, Drew Barrymore, James Franco, and the cast of Grey’s Anatomy. Is it true that Joan McNamara herself, apron-adorned and frothy coffee-in-hand every morning, is as sincere and gracious as your favorite neighbor ~ as we promise our tour guests? Yes. It's true. She is. What foods call you home? Things roasting in the oven, especially chicken and now roast turkey for the holidays; anything that is about warmth in the kitchen. Macaroni and cheese; the one we make here is the same method my mother used for us at home. She just used up all the leftover cheese; here we have a specific recipe. Cakes baking are something else that I always remember, especially Bundt-type cakes. Once my mother used granulated instead of powdered sugar for frosting, so that “crunchy frosting cake” we just called Sidewalk Cake because the frosting cracked. What is your favorite season for cooking, and ingredients? Probably this time of year, with Thanksgiving, since the aromas make you feel like being in the kitchen more than the other times of year. In the summer though, I did spend lots of time in the kitchen to make homemade apricot jam! I was in the kitchen with my mom from the time I was very young but it wasn’t really about teaching as much as breathing and eating, being together. My parents were European (from CzechoSlovakia), and we always cooked, danced, and sang in the kitchen. I love to sing! With my mom and aunties, I made apple strudel with fresh dough that we pulled on the dining room table. I ran Dione Lucas’ cooking school in New York, and that is when I began making pie crusts and pastry. What is one fun thing about you that we don’t know yet? I love being wacky and spontaneous! I also love exploring and experimenting. Little Henry (Joan’s grandson, 4) reported his Thanksgiving plans, which were posted on Facebook. What really happens on Thanksgiving Day? We prepare the turkey at Susie’s home (“where the children are”). The little ones stand on step stools, and help mix the stuffing with their hands. It’s a team effort! All of the side dishes (which are all my mom’s recipes) and the turkey are taken to the home of friends, there are about 40 of us. We have the big meal, then afterward we cozy and settle in to watch movies. Then it’s time for the second meal, we eat again! Then at home we’ve prepared a second turkey, for our own “leftovers”! 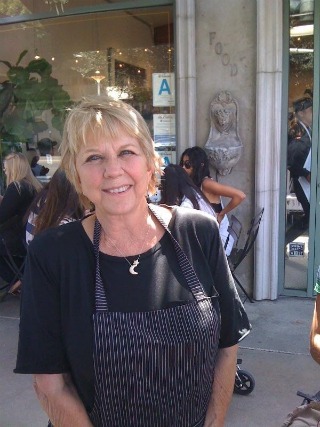 What can fans look forward to from Joan’s on Third in 2012? Now it’s time for Rapid Fire! 10 questions, don’t think, just answer quickly! Brioche or Baguette? Baguette. With butter! NY or LA? New Yorrrrrrrk. I should say LA. Favorite Thanksgiving side dish? Stuffing. And yams. Quick advice to aspiring caterers? GO FOR IT! Do drop in to Joan's fabulous place when you're in the neighborhood, and ask to say hello to the lady herself; she will love meeting you. On behalf of Lisa and our fabulous Melting Pot Food Tours' team, here is wishing you and yours a most Happy and Delicious Thanksgiving!